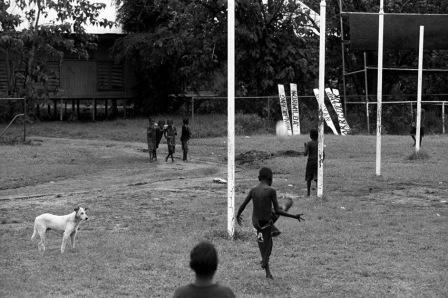 Goal kicking practice at Gunbalanya, 320 kilometres east of Darwin. There are no scoreboard numbers visible to the right of frame but the all-important names of teams are leaning against the fence in the forward pocket. Gunbalanya, also known as Oenpelli, has a community of about 1400 people. Images from Centre Bounce have been exhibited and published extensively, both in Australia and internationally.